The packed bus crawled along through the smog following an inspector who carried a flaming torch so the driver wouldn’t lose sight of him. The ‘Keep Left’ bollards in the middle of the road were circled by metal pots filled with flaming oil, the effect was medieval and frightening. It was only a few yards from the bus stop to the entrance of the estate, but I was nine and on my own, and a choking wall of dirty wet yellow smog blinded me, it was as if the air was solidifying and would smother me. Gripped by the icy fingers of panic I crept along. By feeling my way with my hands I found my block of flats. Indoors a yellowy damp mist hung around the rooms but mum lit the fire and soon everything was warm and homely. Just before Christmas I was walking along Bowditch and caught the rare whiff of smoke from a coal fire. Smells can be very evocative, the scent of a log fire in a country pub, bread baking in the oven, the smell of a coal fire makes me feel nostalgic for simpler times. A tad sentimental perhaps, but I am. 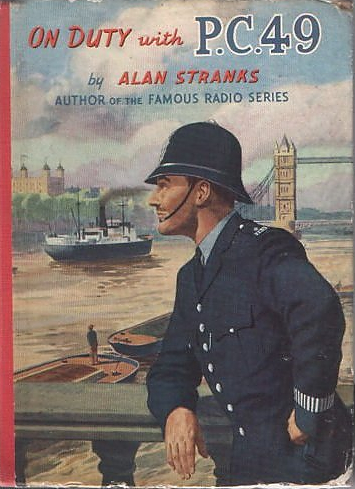 In this romantic reverie I turned into Longshore and walking towards me was a policeman wearing a proper helmet, with a tie under a buttoned tunic, just like my childhood hero PC 49. Nothing ‘hi-vis’ about this copper, and he didn’t appear to be festooned with gas and pepper sprays, batons, and all the other stuff our policemen carry these days. My first thought was he might be an extra in a film that could be shooting nearby, but then I wondered if he was simply a bit of a traditionalist, like me. Whatever he was his appearance was strangely reassuring and added to my nostalgia. Before we lived on the estate, we lived for a few months with my Auntie Clara and Uncle John in their tiny two-up-two-down in Cheam. Coming from Walworth and Peckham Clara believed she was in the country. Her ‘front room’ was only used at Christmas, we lived in the kitchen with its cavernous larder stacked with Ministry of Food dried milk tins. My uncle’s chair was in the corner next to the fireplace. He always had a stash of Dandys and Beanos under the cushion, and sometimes The Beezer. My interest in food started there in that kitchen, Clara cooked old-fashioned food: rabbit, heart, liver and dumplings, bread pudding, and so on. The smell of rabbit or heart cooking transports me back to her kitchen, if I shut my eyes I can see every detail. On Sundays her two grown-up sons came with their families, and eleven of us would squeeze around a table meant for six at the most, while Tip the dog hovered under the table hopefully and the budgie chattered to his mirror. Summer meant salad from the garden, and I first tasted mussels, cockles and winkles, and had my first taste of beer from a spoon wielded by Uncle John. Winter was stews and roasts, I was instructed by my uncle in the mysteries of the Yorkshire Pud, and the pudding mixing became my job on Sunday morning. Uncle was from Newcastle, or “Noocassel” as he said. He’d been a rivet boy in the shipyards, catching red-hot rivets in a bucket (“bunnet” he said because the bucket was conical like a bonnet) as they were thrown up from the quay-side to the riveters. Then came the war and he fought with the 8th Army in the desert, demobbed he met Clara, widowed by the war. They seemed perfectly matched and happy; even happier when Uncle John won a small amount on the Pools, enough to buy a television and bring the toilet indoors! Uncle suffered with his chest, perhaps the searing heat of the rivets, or the dust of the desert, or maybe the coal fire in the kitchen. Or the ounce of Golden Virginia he would send me to buy from the off-licence, along with a bottle of Mackeson for Auntie Clara. The smogs that came in November and December every year were very difficult for him. 1952 was the year of The Great Smog, the smog lasted for 4 days in December and it was reckoned 4,000 people died and 100,000 were made ill by the smog, recent research increases the death toll to 12,000, an almost unimaginable figure by today’s standards. At the time people thought it was normal, something that happened every year, and after all, London was famous for its fog. But this was the worst air pollution episode in our history. I don’t remember the Great Smog but I do remember the St Johns rail crash in the thick fog of December 1957 when 90 people died. 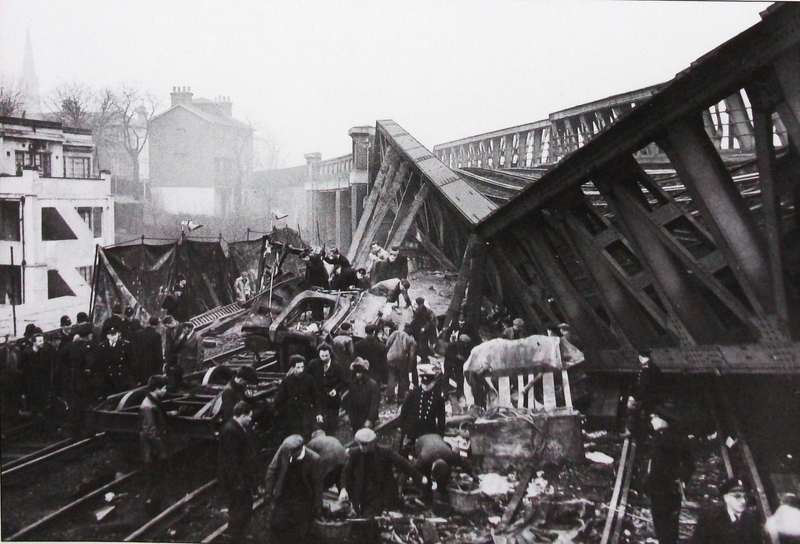 St John's Rail Crash 1957, from "St John's Lewisham 50 Years On, Restoring the Traffic." By Peter Tatlow. Published by The Oakwood Press. The smogs weren’t a 20th Century phenomenon, the mid 19th Century suffered from endless smogs caused by hundreds of thousands of household chimneys, thousands of factories, and the power stations. Deptford and Greenwich both had power stations, Deptford’s first was at the Stowage, in 1891 it was the biggest power station in the world and operated till 1957. Another power station, Deptford West, was built in 1929 and operated till 1983. 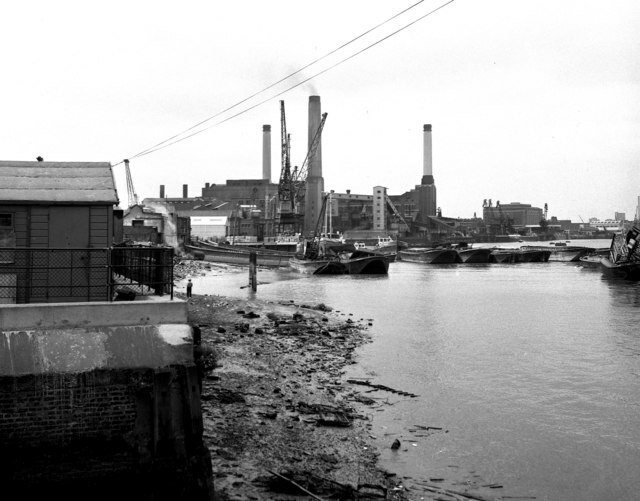 Deptford West Power Station in 1973. Photograph from geograph.org. Charles Dickens used the thick yellow smog as a metaphor for the law in ‘Bleak House’, something common to everyone but at the same time keeps them apart. 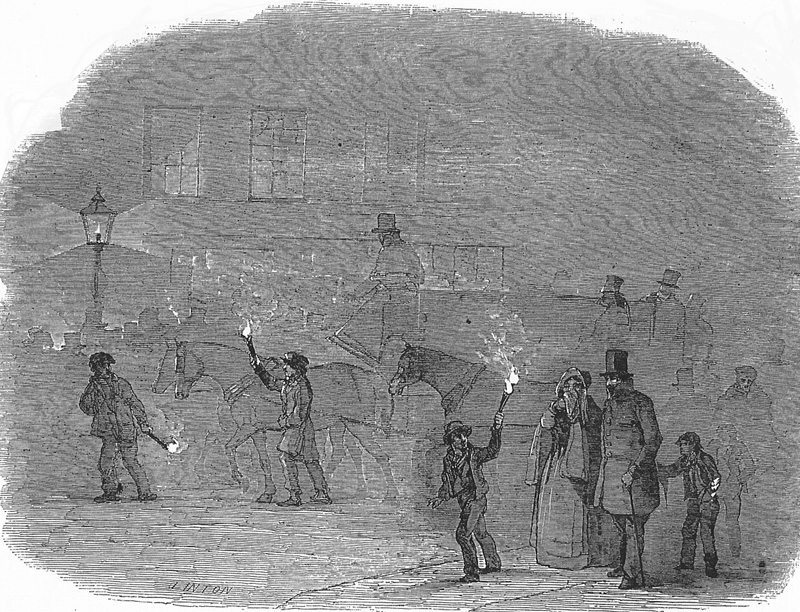 In ‘Barnaby Rudge’ he mentions the ‘link boys’ that carried flaming torches and for a ‘joey’ (fourpenny bit) would guide you home. Pea soup was sold, half a pint for a halfpenny, on street corners; in the mid 19th Century it was estimated there were 500 pea soup stands in London. Made at home by the poorest it was reheated over and over, ‘Pease porridge hot, Pease porridge cold, Pease porridge in the pot Nine days old‘ goes the old nursery rhyme. 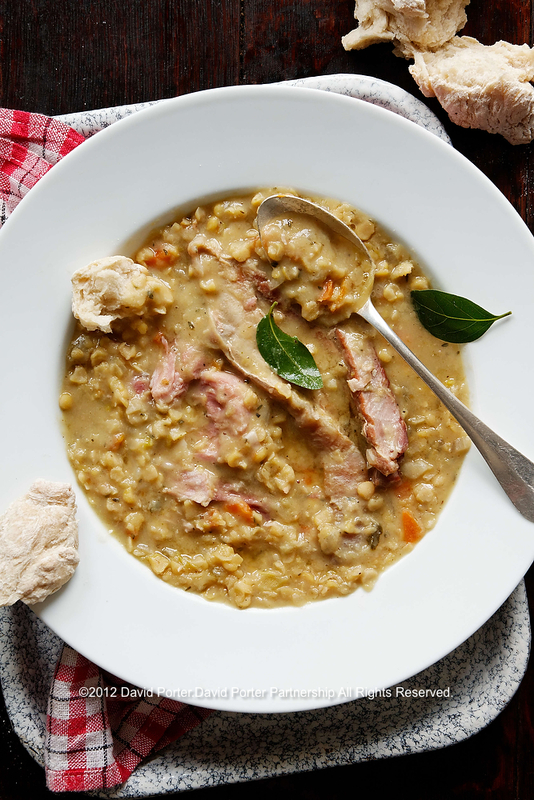 Pease was both singular and plural, porridge was pottage a thick semi-solid dish now called Pease Pudding. Auntie Clara often made Pease Pudding for my uncle, in the north-east it was almost the national dish. I didn’t like it much when I was younger, now of course I love it. The yellow pea soup is more solid than liquid and gave the fog its name: ‘pea-souper’. 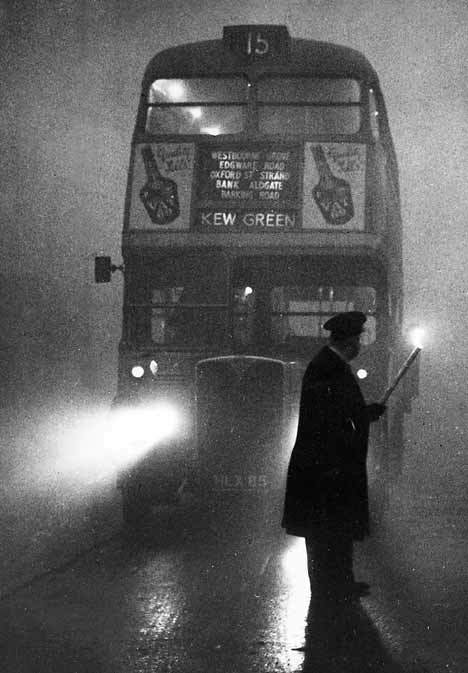 Because the smog was particular to London it became known as ‘A London Particular’. Pea Soup, A London Particular. Preparation time: 10 – 15 minutes. Cooking time: 2 hrs 10mins. A little oil, or lard (more traditional), about a serving spoonful. 675 g vegetables, finely chopped, to include half a large onion, carrots, 2 or 3 sticks of celery. 1 bay leaf, 2 or 3 sprigs of fresh thyme, and 3 pieces of parsley. All tied together with string. Season the pork strips with some rock salt. Melt the oil or lard in a very large pan, the type your auntie would own, then brown the pork on all sides till the fat begins to melt. Add the vegetables and the peas (the soaked peas will have more than doubled in weight) to the pan. Tuck the ham hock and the herbs in the middle and cover with boiling water. Simmer gently for 2 hours, stirring occasionally. Season with some freshly ground black pepper. You can serve immediately, or let it cool then reheat it (remember the rhyme, pease pudding hot, pease pudding cold…). Serve in large bowls with a pork strip and a couple of slices of the ham. Garnish with small bay leaves and have some fresh bread to soak up the soup . This entry was posted on Friday, January 6th, 2012 at 19:55	and tagged with "Bleak House", "London Particular", "pea-souper", "pease pottage", "yellow split peas", coal fire, Deptford, Fog, pudding, soup and posted in Recipe. You can follow any responses to this entry through the RSS 2.0 feed. A pea-soup-er of a blogpost. Robust and enriching. Great write up, thanks for the pea soup recipe. I will give that a try next weekend. depth of field, depth of play, depth of deptford.